Title : Ille et Vilaine. Map maker : LEGENISEL / BARBIER. Date : Paris, J. Migeon, 1871. Size : 9.8 x 8.3 inches. / 25.0 x 21.2 cm. 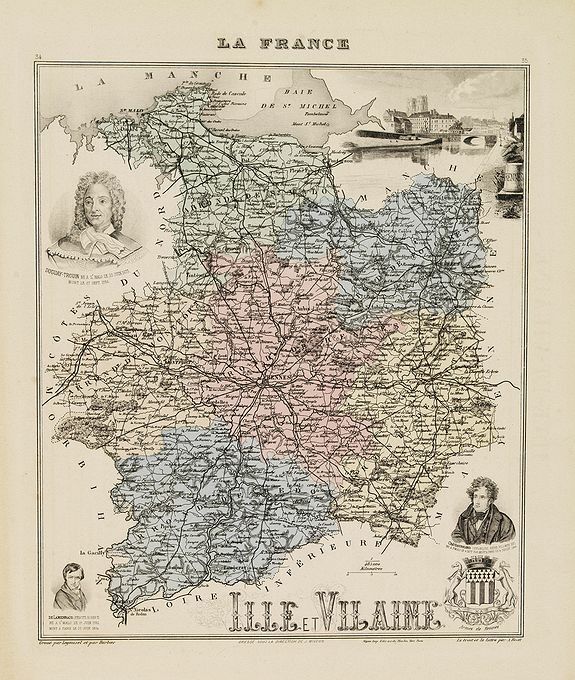 Description :Decorative detailed map, centered on Rennes, prepared by J.Migeon and engraved by Legénisel and Barbier. With portrait of Chateaubriand, Duguay-Trouin, Felicité Robert de Lamennais and view of Rennes. Published in "Nouvel Atlas Illustré des Départements et des Colonies". Condition : Steel engraved plate with insets along the borders. Full body colours.